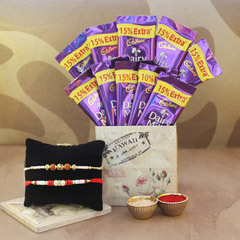 Celebrate Rakhi with style this year from the exciting range of online Rakhi gift hampers from SendRakhi.com. We bring you some of the best Rakhi souvenirs that you can shop from and arrange for quick delivery. This year send Rakhi to Washington and surprise your brother with beautiful silk Rakhis along with mouthwatering Indian confectioneries and sweet meats to make it’s a memorable event both for you and your brother. Rakhi is a festival which is much more than an occasion when you wish your brother all the good in the world and tie silk threads around their wrists. This is the time when you pamper your brothers with all the lip-smacking food they love. The concoction of Indian sweets like plates full of kaju katlis, mewa rolls, laddoos, raj bhogs, rasgullas, barfis etc are an all-time favourite with the Indian brothers and sisters love to spoil their brothers with all this on the occasion of Rakhi. At SendRakhi.com we understand this perfectly and hence have come up with a large variety of Rakhi hampers that includes beautiful silk Rakhis and assortment delicious Indian sweets, chocolates, and assorted nuts. Shop these gift hampers and send Rakhi to Washington to surprise your brother sitting thousands of kilometers away from you. Our services of Rakhi delivery to Washington destinations are a trusted one that is used by thousands of customers from all over the world. Shop from our online collection which can compete with any Rakhi shop all over the world and send the best quality products for your brother. With us send Rakhi to Washington in no time and surprise your brother this Rakhi. Our Rakhi gifts to Washington are assured by our partners of delivery to bring a special smile to your face.